We have definitely stepped in an era of smart tooth brushes. Tooth brushes that can actually tell you how well you have brushed your teeth and what is the oral hygienic state of your mouth. The Oral B Triumph 5000 is definitely the tooth brush of the future. The smart series keeps on getting better and better. The toothbrush has built its reputation as the best plaque remover ever. It can remove 100% more plaque than any manual brush. It has been recognized as the best toothbrush by users and professional alike and is approved by the British Dental Health Foundation. On the outside the Oral B Triumph 5000 is a good looking, sophisticated and slim looking gadget. The ergonomic grip and the specifically contoured design make it really easy to hold without any chance of slipping. The handle is more than comfortable. The stop button is easily reachable by a finger and the LED light indicates battery life. The toothbrush guides you how to brush your teeth in a way that when you are brushing too hard you will get three types of signals. The first signal you get is the auditory signal; if you are brushing too hard or have brushed for too long the toothbrush’s pulsating action stops automatically. This changes the sound of the brush and you know that you are doing something wrong. If you still don’t stop the Red LED light begins to flash to give you a visual signal. Finally the brush automatically switches to sensitive brushing mode to give you a sensory signal that you need to stop. The Oral B Triumph 5000 comes with a Digital Smart Guide Unit. The system has a star rating system and the stars light up according to the quality of brushing for two minutes as is recommended by dentists. The smart guide also provides feedback on how well you have brushed, which zones of the mouth you need to focus on and how much pressure you need to apply when you are brushing. You get a signal after every 30 seconds to move to the next quadrant of your mouth. A two minute timer indicates when the brushing time is up. 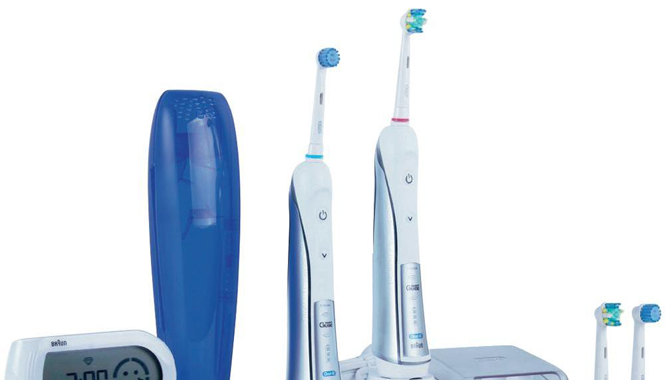 The Oral B Triumph 5000 has 5 different modes in which you can brush. The Daily clean mode is for every day cleaning. The Massage mode is for gently massaging the gums. In the sensitive mode you can gently and thoroughly clean the sensitive areas of your mouth. With the Polishing mode you can remove the stains and whiten your teeth. The Deep clean mode will give you such a thorough clean that you will have the feel of a professional cleaning. The Oral B Triumph 5000, like Oral B 4000, is compatible with a variety of brush heads so you can easily choose the one you prefer. The new 3D brushing technology; oscillating, vibrating and pulsating ensures that the plaque is efficiently removed from even the hard to reach areas of your mouth. The battery when fully charged lasts for 10 days and the package includes charging station, travel case, a two pin plug and three different brush heads.